The origin of the dulcimer is as elusive as its haunting sound. Two types of instrument stake claim to the name—both have different shapes, different methods of being played, and diverse origins. The fretted dulcimer resembles an elongated violin with a limited number of strings (usually three to five) that can be plucked or bowed. In the United States, the fretted dulcimer is better known as the Appalachian or Mountain dulcimer. The hammered dulcimer is rectangular or trapezoidal in shape and has sets of multiple strings with a range of up to three octaves. The instrument is played with two light-weight beaters called hammers that are shaped like long-handled spoons and are used to strike the strings. The history of both dulcimers is confused because they were developed to play folk music and sprang up independently in a number of locations in Europe and the Middle East. It is not known how or if varieties of dulcimers crossed cultural or topographic barriers. The hammered dulcimer is considered a member of the zither family and may have origins in Iran as the citar or santir, an instrument used to produce the ancient classical music of Persia. The spice and silk trades that criscrossed the Middle East during the Middle Ages and the Renaissance may have been responsible for the instrument's presence in Spain by the twelfth century and its appearance in China. In China, it is called the yangqin, yang ch 'in, or foreign zither. 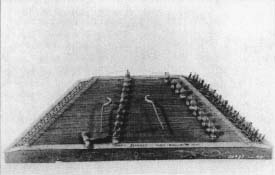 The French version of the hammered zither was called the tympanon, and it's strings were struck with leather-covered hammers. The instrument experienced great popularity from about 1697-1770 due to an inventor named Pantaleon Hebestreit, who constructed a version with 186 strings and named it a pantaleon. The instrument appeared to fade in popularity with the rise of the piano. By unknown paths of immigration, hammered dulcimers arrived in the United States. The instrument was sufficiently popular to have been carried by both the Montgomery Ward and Sears Roebuck catalogues in the 1800s and early 1900s. The hammered dulcimer was also reportedly the favorite instrument of Henry Ford and enjoyed a mild revival thanks to his admirers. The harpsichord and pianoforte (or piano) are hammered dulcimers to which keyboards have been attached. The Appalachian dulcimer or dulcimore is generally hourglass-shaped with three to five strings and frets (low ridges against which the strings are pressed). Its strings are plucked with the fingers, a pick, or a quill, and the player's left hand holds a stick or plectrum on the strings as a stop. Nordic settlers claim to have brought the dulcimer to the New World. The Swedes brought their version called a humle, Icelanders imported the langspil, and Norwegian immigrants brought the langleik. The Germans and Dutch had developed two instruments, the scheitholt and the hummel, which became the folk instrument of Pennsylvania where so many Germans settled. To this mix of variants, the French added their Epinette des Vosges, which is less box-like and more similar in shape to a violin. Many of the Scotch-Irish who left Ireland in the early 1700s settled first in Pennsylvania before following the frontiersmen to the Appalachian mountains and along the Ohio River. While in Pennsylvania, they may well have heard the scheitholt or humle played by the Pennsylvania Dutch. The German instruments were elongated boxes with frets and a limited number of strings; these either merged with British versions or were developed by the Scotch-Irish settlers to form the hourglass-shaped instrument now known as the Appalachian dulcimer. As the history of the dulcimer suggests, almost anything goes in selecting the shape of an Appalachian dulcimer. The size and depth of the soundbox must be chosen for the desired sound of the instrument. The deeper and larger boxes produce both louder and lower tones. Perhaps the most eye-catching and apparently ornamental feature of the dulcimer is the sound holes. Some of these are both beautiful and elaborate. The actual shape of the hole does not affect the sound, but the length of slots or elongated holes is important. Like the f holes in a violin, they free longer pieces of the sound-board from the constraining effects of the rigid sides so that the soundboard vibrates more responsively to the strings. 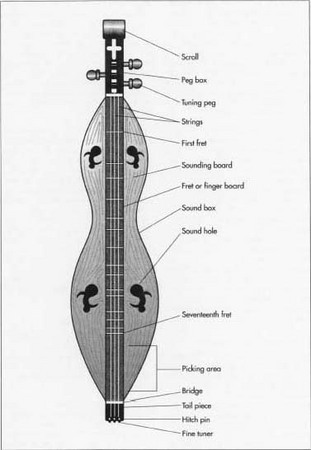 Design of a dulcimer begins with making a pattern and selecting the size of the instrument. Size is determined from the outside in. Strings are available from manufacturers in standard lengths between 25-30 in (63.5-76.2 cm). The soundbar is as long as the strings, but because it is fixed to the sound-box with a nut several inches down from the top of the solid end of the box, the soundbox must be longer than the soundboard. The soundbox is usually 6-8 in (15.2-20.3 cm) wide and up to 2 in (5.08 cm) deep. The maximum measurements have proven to produce the best sound character, including loudness and timbre, or quality of sound. After the basic dimensions are chosen, a pattern is made on paper or cardboard. One half of the dulcimer is outlined on the paper, which is folded on the axis and cut to produce the mirror image. A form will be made to shape the upper and lower curves of the dulcimer, so before the pattern is cut, a partial pattern is made of this shape so that top and bottom match. A dulcimer mode by Henry Bryan! of Wolfeboro, New Hampshire, in 1898. The hammered dulcimer produces a sweet sound. In fact, the word dulcimer is derived from the Greek meaning sweet (dulce) and song (menos). While the Greeks or Persians may have invented it nearly 1,000 years ago, Europeans were likely introduced to the dulcimer during the Crusades. It soon became a favorite at royal court, but musicians complained about the lack of dynamic range of the instrument. The dulcimer's stringed keyboard eventually led to the development of the pianoforte, which did offer a dynamic range, ultimately eclipsing the dulcimer in popularity. While the dulcimer was no longer a court instrument, it remained a great favorite with street musicians, gypsies, and other plain folk. This trapezoidal-shaped hammered dulcimer was lovingly made at the rurn-of-the-century, Red with gold-painted scrolls and varnished trim, it is proudly emblazed with "Henry Bryant-Maker-Wolfeboro NH 1898." While we don't know much about Henry Bryant, we suspect that he may have been a dulcimer player who typically found it difficult to acquire dulcimers and had to resort to constructing his own instruments. Happily, the sweet song of the hammered dulcimer was rediscovered in the early twentieth century with the revival of early American folk music and interest swelled again in the 1960s. Today, hammered dulcimers are available readily and there is a burgeoning fascination with its soothing sound. Many types of fine wood can be used to make a dulcimer. The outer wood forms the finish and should be selected for its beauty and grain, while the inner wood (usually oak) does not have to be attractive, although the material must respond to steam used to soften and shape the sides. The outer or finish wood used for the soundboard may be walnut, spruce, pine, or yellow poplar and should produce a bright sound due to the presence of hard and soft streaks in the wood. Such striations will give the finished dulcimer visual as well as aural beauty. The body of the dulcimer is usually made of harder wood like cherry, black walnut, or mahogany. The tuning pegs are Brazilian rosewood, although old dulcimers have ebony, rosewood, metal, or crude wooden pegs. Frets on old dulcimers were also made of a variety of materials including silver, steel, brass, staghorn, ivory, bone, and various woods. Today, commercially-made fretting material is manufactured by specialists in a tee-shaped cross section that is convenient to fit to an instrument. These frets are made of nickel silver or brass. Also made by specialty manufacturers, dulcimer strings are standard, using the same strings as are manufactured for 12-string guitars. 1 After the design is selected and the pattern is made, dies must be constructed to form the sides of the dulcimer. Only two shapes are involved—the curves of the upper and lower sections of the instrument called bouts and the center violin-like cutout called a waist, which may be any simple curve including a circle. Heavy blocks of wood are used to make the dies. The curves are cut with a band saw and sanded to match exactly. 2 A master jig assembly is also an important preliminary. The jig is a piece of plywood that is used to mount and form the dulcimer. Typically, a piece of 0.75 in (1.9 cm) thick plywood that is about 10 in (25.4 cm) longer than the dulcimer and 4 or 5 in (10.2-13 cm) wider is selected. The pattern is mounted on the center of the board, and fourpenny finishing nails are driven into the board at 2 in (5.1 cm) spacings around the pattern's edge with extra room at the ends. The nails support the inside of the sides of the instrument while it is being shaped. 3 To shape the sides, 0.125 in (0.32 cm) thick wood is cut in pieces that are as deep as the dulcimer and longer than the curves forming the soundbox. One piece of finish wood backed by a piece of oak is placed in a steam cooker for about 20 minutes to soften the wood. The wood is carefully removed, placed in between the halves of the die, and clamped together. The form with the wood pieces enclosed is then dried in an oven. All the sections are formed this way. Then the outer finish wood piece is glued to the oak backing with polyester or epoxy resin glue. The glued sections are returned to the forming dies and clamped until the glue hardens. 4 When all the curved side sections are formed, the center curves are placed in the master jig assembly. They must be adjusted by eye to be symmetrical. Then, finish nails are driven along the outsides of the sections to hold them in place. The end sections should be fitted to the centerpieces, however all sections were cut long. After the ends are properly fitted, the center sections are removed, cut to their proper lengths, and rasped or sanded for smoothness. The end sections are then refitted. They will overlap the center sections and must be trimmed to mate with the ends of the center sections. Also, the inner oak pieces are trimmed back so they are not exposed on the finished surface. Visual symmetry and tightly fitting joints will produce the most beautiful instrument in sound and appearance. the final chance to adjust the shape of the instrument. 6 Dulcimers often have elaborately scrolled tuning heads at the tops of the instruments. The tuning head has to be large enough to allow 1 in (2.54 cm) spacings between the pegs. Care is also taken to arrange the pegs so the string from one does not ride on the peg for another. Corresponding peg holes on the head are cut and tapered to match. 7 The head consists of three pieces of finish wood that will be sandwiched together. The overall dimension is about 7 in (18 cm) in length and 4 in (10.2 cm) in width. The pieces are clamped or lightly glued together and cut with a band saw to shape the scroll. The pieces are taken apart, a string slot is cut in the bottom of the center section, and the pieces are then permanently glued together. After the glue has hardened, the peg holes are drilled. The instrumentend of the tuning head must then be mortised to fit the instrument and the taper of the tuning head is shaped by careful wood-working and smooth sanding. 8 Four tuning pegs are required. Pieces of 1 in (2.54 cm) square rosewood are cut to 4 in (10.2 cm) lengths. Two inches of the total length are turned to form a tapered peg, and the heads are flattened and shaped so they are easy to grip. The pegs must be individually fitted to the tuning head because the tapers will vary. A tapered reamer is used to ream the holes that were previously drilled through the tuning head. The tuning head can be fitted to the sides of the sound box by carefully matching and fitting the mortises. A fitted block is made to match the base of the tuning head and reinforce the upper end of the sound box. The joints are then glued and clamped securely. For the lower end of the sound box, a tail section is made with mortises to fit the sides of the soundbox. A similar reinforcing block is made for the tail section. 9 The soundboard works as a diaphragm that allows air (and sound) to resonate in the instrument. Grains in the wood should extend the full length of the soundbox. The soundboard is made in two sections with a gap of about 1 in (2.54 cm) between the two halves to allow for the hollow portion of the soundbar. The soundboard is also cut to extend about 0.125 in (0.32 cm) beyond the sides of the dulcimer. The two halves are fitted to the sides with the overhanging lip and glued and clamped in place. 10 The soundbar is the length of the soundbox plus 0.5 in (1.3 cm), extending up into the tuning head. It is constructed of three pieces of wood to be semihollow. That is, two pieces of finish wood form the sides and the top piece forms the finger-board, leaving a three-sided center tunnel or tube down the middle of the soundboard. Finish pieces are cut to close the top and bottom ends of the soundbar, and the whole assembly is fitted and glued into place. Edges and ends are checked for squareness and are smoothed. The hole for the nut used to fix the soundbar to the soundbox is drilled several inches below the junction of the soundbar with the tuning head so the two are not acoustically connected. The nut is the only connection attaching the soundbar to the soundbox, again allowing for vibration and resonance. 11 Frets are positioned on the fingerboard of the soundbar based on calculations related to the string length of the instrument. The fret positions are usually tempered by comparing tones with a tuned piano and repositioning the frets before they are permanently placed. Prefabricated metal fret material is hammered into saw cuts at the locations of the frets. The saw cuts are extremely thin and about 0.0625 in 0.16 cm) deep. Overcutting causes the frets to rattle. The edges of the finished frets are filed for smoothness and level. A bridge is also cut from hard maple. It is placed at the tail end of the dulcimer to support the strings and is allowed to float in place, rather than being glued, to permit fine adjustment of the strings and optimal sound. 12 Finally, the back of the soundbox is cut from the finish wood in a single piece and with a 0.125 in (0.32 cm) overlap around the edge. The back is glued to all the edges and braces on the backside of the instrument. 13 The strings are fitted to the instrument before the wood is finished. Holes are drilled in the tailpiece and the tuning pegs. Fine, equally spaced notches are cut in the bridge and the nut to support the strings when they are tightened. Three steel strings that are each 0.012 in (0.03 cm) in diameter and one 0.022 in (0.56 cm) wound steel string are typically used on a four-string dulcimer. The strings are threaded individually through the tailpiece, over the bridge and nut, and through the holes in the tuning pegs. Each peg is turned until the string is tight. The clearance of the string at each position is checked and the strings are lowered at the nut by cutting deeper notches. The bridge is also adjusted to correct the string length. 14 The strings, bridge, and tuning pegs are removed before the instrument is finished. The finish that is selected is essentially a part of the design of the instrument because the type of wood, its grain, the desired sound effects, and the final appearance are all considerations. Some dulcimers are left completely unfinished. Rubbing fine wood with linseed oil or applying superb varnish finishes are options. Hand-rubbing and oiling or waxing can take hundreds of hours to fill the wood pores. Application of a sealer followed by wax will produce a similar appearance with less labor. As with all handmade products, quality control is in the hands of the maker. The end result of the dulcimer maker's craftsmanship is considered from the conception of the instrument forward, and many careful hours are spent in achieving a final product that is as beautiful as intended. Quality control may also be in the ear of the beholder; the craftsman's care will be evident in the sound the instrument produces. Renewed interest in folk music has awakened the interest of hobbyists and musicians in dulcimers. The instrument is easier to play than more sophisticated instruments that require long hours of training and practice. Dulcimer-making kits are available from a number of suppliers. Alvey, R. Gerald. Dulcimer Maker: The Craft of Homer Ledford. The University Press of Kentucky, 1984. Hines, Chet. How to Make and Play the Dulcimore. Stackpole Books, 1973. Murphy, Michael. The Appalachian Dulcimer Book. St. Clairsville, Ohio: Folksay Press, 1980. Ritchie, Jean. The Dulcimer Book. New York: Oak Publications, 1974. Charlie Alm's Hammered Dulcimer Book. www.dcwi.com/dulcimer . The Dulcimer Factory. www.Instar.com/mallldulcimer/dulcfac2.htm . The Dulcimer Shop. www.databahn.net/dulcimer . Frequently Asked Questions About the Hammered Dulcimer. www.dulcimer.com/faq.html . Hammered Dulcimer Page. www.rtpnet.org/-hdweb/ . Joe Zsigray's Mountain Dulcimer Page. www.wcnet.org/-jrz100/mountain-d/ . Mike's Hammered Dulcimer. www.halcyon.com/riston/home/dulcimer.htm . I was looking for information on the types of wood used to construct the mountain dulcimer, and you have provided a wonderful insight to this process, and a great overall view as well. Many Thanks & Best Wishes!